IQ Option is the leader of our top 2 binary options platforms with its top-notch user interface for traders and excellent fusing of functionality and transparency. It is considered as one of the most reliable and trustworthy binary brokers in the industry as it's licensed and regulated by the Cyprus Securities and Exchange Commission (CySec). The company is fully compliant with all the regulations of the commission and is authorized to operate and sell their products in a number of jurisdictions. The online trading platform is one of the best in industry standards. Aside from binary options, IQ Option also offers other alternatives including Contracts for Difference (CFDs) on stocks, Crypto currencies, Forex, Exchange Traded Funds (ETF), and digital options (with assets such as commodities, currencies, indices, and stocks). It's a robust application that's packed with features that meet the needs of different types of traders – from professional ones to the newcomers – as it's both functional and easy to use. Learning how the platform and binary options work is streamlined with the wealth of education and training resources provided by IQ Option. Materials such as tutorials, videos, webinars, e-books, and FAQ sections are easily available for traders to utilize. Additionally, it offers convenience to its users with flexible deposit and withdrawal methods. It gives its users a wide array of options to fund their account via debit card, credit card, Skrill, WebMoney, Cash U, Neteller, Moneybookers, wire transfer, and even using Bitcoins. Withdrawing money is just as convenient. ⦁	Desktop. The app can be downloaded or accessed in the web on your PC or Mac. It offers four different layouts (line, candlestick, area, and bar) to view the charts according to your preference. It lets you make multiple trades and has technical analysis features. ⦁	Mobile. It has a tailored mobile app that's available on Android, iOS, and Windows versions. The interface is familiar as it's designed to match the desktop version's buttons, screen, look, and feel. ⦁	Demo account. 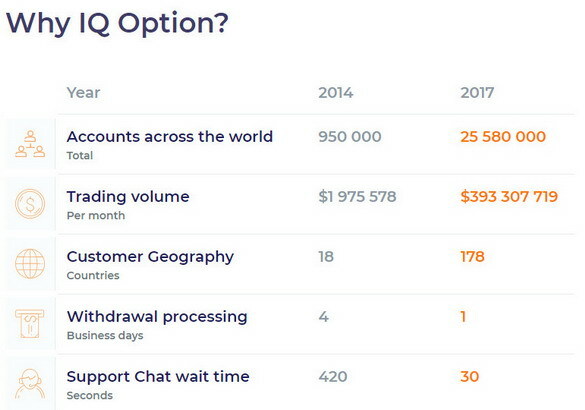 One of the best in the industry, IQ Option gives users a demo account with a renewable supply of virtual funds. It runs alongside a real money account. ⦁	Live account. Traders can immediately start trading by depositing a low minimum investment amount of $10 to access your live account. Having a real account allows users to participate in trading competitions, access more than 70 assets, and request withdrawal processing within 24 hours. ⦁	VIP account. In addition to the features of a real account, a VIP account provides you a personal manager to assist you with any issues and inquiries and a monthly report on your trading records for insightful feedbacks. This account has higher payouts, entry to bigger tournaments, and exclusive educational materials. To get a VIP account, the user must deposit a minimum of $3,000. Next on the list is Binary.com, one of the more established and respected brokers for binary options. It is fully licensed and regulated by the Isle of Man's Gambling Supervision Commission which ensures the company stays compliant with the relevant regulations. It has one of the lowest minimum deposit requirements in the industry which makes it appealing to many traders. The platform is known for being simple, straightforward, and easy to use. This lets you seamlessly execute your trade within seconds, track your portfolio in real time, sell trades at market prices and identify the appropriate trade for each market condition. As you scroll down, you'll see comprehensive chart features that you can view in interactive, pop-up, line, and legacy viewing options. The trade types they offer include Rise/Fall Option Contract, Higher/Lower Option Contract, Touch/No Touch Option Contract, and Tick Trades which all sets them apart from other brokers. Binary.com allows users to trade with flexibility. You can choose from a duration of 10 seconds to 365 days, a payout from $1 to $50,000, your own strike, and assets that range from stocks, indices, commodities, and major currencies. Another innovative feature of the platform is their "Binary Bot" service that assists traders to configure and build their auto-trader. Depositing and withdrawing funds to and from your account can be done by debit and credit card, e-wallets (such as Skrill and OK Pay), money transfer, and bank wire. ⦁	Desktop. It has a user-friendly platform with the basic functionalities and detailed features. It operates in real-time and lets you execute trades within seconds. ⦁	Mobile. Retaining the desktop version's look and feel, the mobile app is optimized for Android and iOS devices. 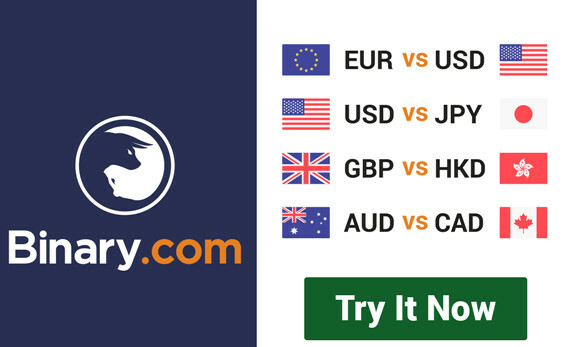 It's designed carefully for traders to do quick, on-the-go trading anytime, anywhere. ⦁	Virtual demo account. A Binary.com demo account that you can quickly sign up on from your desktop or smartphone. It provides $10,000 for novice traders to practice and get the hang of trading binary options before even depositing your own money. ⦁	Real account. Once you decide to move to a real trading account, all you have to is make a very low initial deposit of $/£/€5. You can then easily access your virtual and real account via the menu box as you need.